15 And so Pilate, willing to content the people, released Barabbas unto them, and delivered Jesus, when he had scourged him, to be crucified. 16 And the soldiers led him away into the hall, called Praetorium; and they call together the whole band. 17 And they clothed him with purple, and platted a crown of thorns, and put it about his head, 18 And began to salute him, Hail, King of the Jews! 19 And they smote him on the head with a reed, and did spit upon him, and bowing their knees worshipped him. 20 And when they had mocked him, they took off the purple from him, and put his own clothes on him, and led him out to crucify him. 21 And they compel one Simon a Cyrenian, who passed by, coming out of the country, the father of Alexander and Rufus, to bear his cross. 22 And they bring him unto the place Golgotha, which is, being interpreted, The place of a skull. 23 And they gave him to drink wine mingled with myrrh: but he received it not. 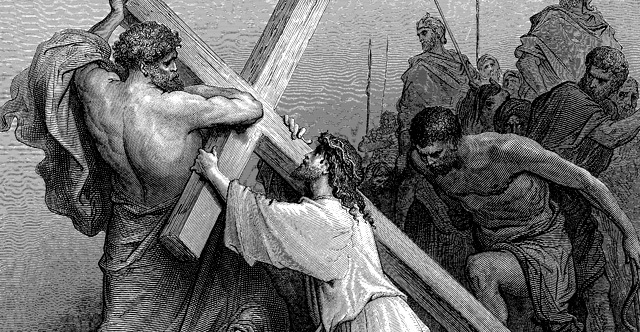 24 And when they had crucified him, they parted his garments, casting lots upon them, what every man should take. 25 And it was the third hour, and they crucified him. 26 And the superscription of his accusation was written over, THE KING OF THE JEWS. 27 And with him they crucify two thieves; the one on his right hand, and the other on his left. 28 And the scripture was fulfilled, which saith, And he was numbered with the transgressors. 29 And they that passed by railed on him, wagging their heads, and saying, Ah, thou that destroyest the temple, and buildest it in three days, 30 Save thyself, and come down from the cross. 31 Likewise also the chief priests mocking said among themselves with the scribes, He saved others; himself he cannot save. 32 Let Christ the King of Israel descend now from the cross, that we may see and believe. And they that were crucified with him reviled him. 33 And when the sixth hour was come, there was darkness over the whole land until the ninth hour. 34 And at the ninth hour Jesus cried with a loud voice, saying, Eloi, Eloi, lama sabachthani? which is, being interpreted, My God, my God, why hast thou forsaken me? 35 And some of them that stood by, when they heard it, said, Behold, he calleth Elias. 36 And one ran and filled a spunge full of vinegar, and put it on a reed, and gave him to drink, saying, Let alone; let us see whether Elias will come to take him down. 37 And Jesus cried with a loud voice, and gave up the ghost. 38 And the veil of the temple was rent in twain from the top to the bottom.